2 Method 2: Using ‘Select’ class. Hiya rockstars (guitar and music not included though)! In this post, we delve into dropdowns and how to select items in two ways. And yes, we also talk about multiple selections! All concepts will be explained along with examples from our Demo Site. Using the same age old traditional way of locating elements using one of the available locating strategies. First, we find the dropdown element and then locate the required item to select. This is little difficult as the options have no unique identifiers. Example: Let us locate ‘Programming Languages’ dropdown by its id. To locate ‘C++’ from the available dropdown items, we will have to find all the elements with tag name ‘options’ and get it in a list. Iterate through the list or if its index is known, retrieve the elements accordingly and perform click action. Here 0, 1, 2, 3 are index values of the dropdown. Method 2: Using ‘Select’ class. Let us delve in and understand how Select class works and see if it is magical by any chance. And why would you want to use this in the first place? Using method 1 has a major disadvantage. Selecting a specific option becomes very difficult as they have no unique identifiers. Also, to select multiple options, deselect a particular item, it gets complicated. Selenium webdriver once again comes to our rescue! It provides Select class with pre-defined methods specially for handling dropdowns and multiple selection scenarios. Step 1: This select class is available in “org.openqa.selenium.support.ui.Select” package. Hence it is mandatory to import this package in our test script. Step 2: Create an instance for the Select class by passing required dropdown identifier. Any of the previously discussed locating strategies (https://javabeginnerstutorial.com/selenium/9j-webdriver-locating-elements-1/) can be used to locate the dropdown. Step 3: Once the dropdown web element is located and an object for Select class is created, all its methods can be accessed to perform selection and deselection. Select class works only for web elements that have <select> tags. Below is a snapshot of all the methods available in Select class. There are a lot of essentials to discuss and juggle here. Let us distil some of the commonly used methods with examples and code snippets. You might bump into NoSuchElementException with all select and deselect methods in case no matching options are found. These methods select and deselect an option with the displayed text that matches exactly with the passed String argument. These methods select and deselect an option whose value attribute matches the passed String argument. Example: Let us select ‘Selenium RC’ from Selenium Tool Suite multi selection options. The value of the ‘value’ attribute, “RC” is to be passed as the argument to the selectByValue method. These methods select and deselect an option at the specified index value. It is important to note that the index value always starts with zero. Example: Let us deselect ‘Selenium RC’ from Selenium Tool Suite multi selection options. 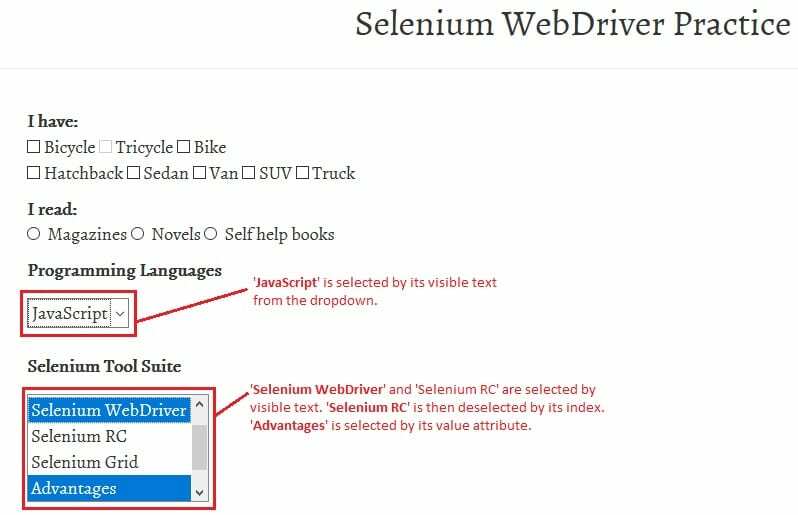 Based on the HTML code, Selenium IDE has index 0, Selenium WebDriver has index 1 and Selenium RC has index 2. This method clears the selection. No argument is passed. This method works only for multi select scenarios i.e. <select> tag should have a multiple attribute with value as “multiple”. Otherwise it throws “NotImplementedError”. Example: Let us deselect all the options selected in the Selenium Tool Suite multi select box. This method comes handy when you wish to know if the web element allows multi selection or not. It returns either true or false. No arguments are passed. This method returns a list of all the options available in the multi selection box as web elements. This method returns the first selected option in a multi selection box. If this is used on a dropdown where only a single selection is allowed, then the selected option is returned as a web element. This returns the option text that is selected. This method returns a list of all the options that are selected as part of a multi selection box as web elements. Each line of code is accompanied with self-explanatory comments as well as parts of the code are explained as part of each concept covered in the post. This concept is not so hard to wrap your heads around. So get going and practice a huge lot. I will see you soon in another post. Have a great day! Article is very informative and explained in nice manner.